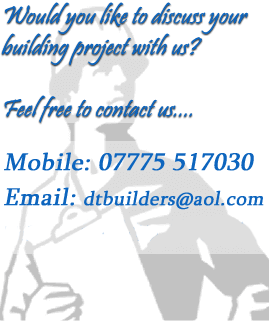 D T Builders will not collect any personally identifiable information about you (e.g. name, address, telephone number, e-mail address) unless you provide it to us voluntarily. If you do not want your personal information collected, please do not submit it. For each visitor to D T Builders, our web server automatically recognises information such as your domain, the type of internet browser you are using, the type of computer operating system you are using, and the domain name of the Web site from which you linked to our site. This non-personally identifiable information is collected automatically, used for internal review and to target future improvements. This website does not have a contact form so we will use the information you have willingly given via email to us to contact you back about any building work to be undertaken. If you would like to remove all your personal information from our records, please email us. We will not keep hold of your email and any other data you chose to give us for any longer than neccesary. To support our website, we sometimes embed photos and video content from websites such as Facebook, Twitter, YouTube and Flickr. As a result, when you visit a page with content embedded from, for example, Facebook or Twitter you may be presented with cookies from these websites. D T Builders does not control the dissemination of these cookies. You should check the relevant third party website for more information about these.